From Robert Parry: Some readers have urged me to write a new book, expanding on our investigative journalism over the past five years. But before I can start, I need to reduce the stockpile of my last two books Secrecy & Privilege and Neck Deep. So we are offering them at the lowest price yet. You can help us by ordering the two-book set for only $16 or you can get an entire carton (28 books, either of one title or half-and-half of the two) for $56. And for U.S. orders I’ll pay for the postage. We’ll also count whatever we raise toward our spring fundraising goal. The two books contain important recent history, facts that every American should know especially as we head toward an important election. 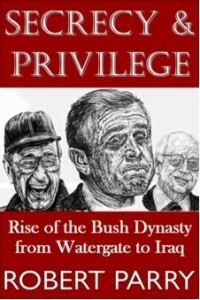 —Secrecy & Privilege explains how George H.W. Bush rose to the White House, starting with his service to Richard Nixon during the Watergate scandal; describes Bush’s bloody year as chief of the CIA; and exposes his secret effort to undermine President Jimmy Carter’s Iran-hostage talks in 1980. —Neck Deep, which I co-wrote with two of my sons, Sam and Nat, takes this remarkable story of the Bush Dynasty forward into the presidency of George W. Bush. The book also reveals the operations of the Right’s powerful propaganda machinery and the partisanship of today’s Republican-controlled U.S. Supreme Court. These solidly reported histories should be part of every library. And you can help by getting a set for yourself, a friend or a public or school library. –Or you can send a check for $16 or $56 to The Media Consortium; Suite 102-231; 2200 Wilson Blvd. ; Arlington, VA 22201. Regarding the full-carton offer, you can get either a full box of Secrecy & Privilege or Neck Deep (28 copies in paperback) or you can ask for a half-and-half split (14 of each). Or you can get a full carton of Neck Deep in hard cover (24 per box).